Sails solo around the world! "My team is simply 'Nereida' and me!" 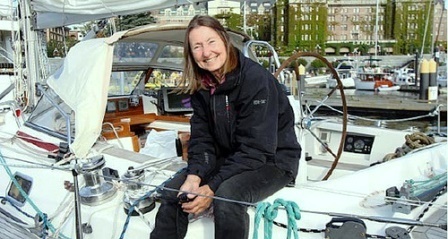 The oldest women sailor Jeanne Socrates at the age of 70 years sailed nonstop, unassisted and single handed around the world! 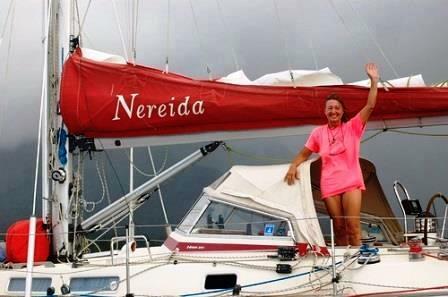 A wonderful accomplishment for this retired math’s teacher aboard her 11 meter yacht Nereida the voyage took her 259 days and was her 3rd attempt. Her yacht a new Nereida was commissioned on the River Hamble, near Southampton Water, in 2009, after being fitted out in Sweden at the beginning of the year. It's a Najad 380, she's an updated, re-designed version of the previous Najad 361. 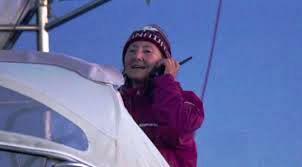 Her aim was to circumnavigated via the Five Great Capes, sailed round Cape Horn and the Southern Ocean - all attempts made without the help of a shore-based support team and become the oldest women sailor. 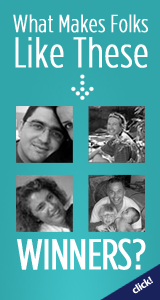 Jeanne is a British lady and she left from North America October 2012 arriving back July 2013 to fulfil her goal, her dream. The initial plan was to trial her thoroughly around the Solent and Guernsey, before setting off towards the Canary Islands on a 12-day offshore passage in early September sailing from St Petersport Guernsey in the English Channel and then towards the Canaries. Everything was to be checked and repaired thoroughly again, eventually leaving in November, near the beginning of the Southern summer. Starting from the Atlantic, planning to sail east-about nonstop in higher latitudes, passing south of the Five Great Capes, which include Cape Horn, the journey through the Southern Ocean back to the Canaries was expected to take 6-7 months. 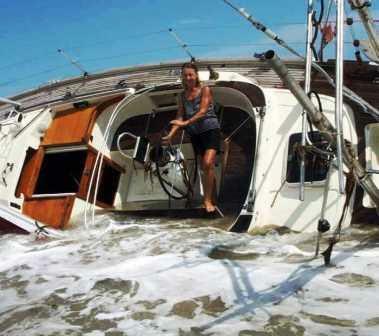 As sailors we know things don't always go to plan but this was a very determined lady and nothing was going to stop her! In 2009 was Jeanne 1st nonstop attempt leaving from the Canary Islands she was forced to stop at Cape Town for repairs after engine and rigging problems during a storm off Cape Horn. She then headed for New Zealand and Hawaii ending in the Strait of Juan de Fuca. In October 2010 she sailed from Victoria (B.C.) and but damage caused by a bad knockdown, about 140 miles west of Cape Horn on Day ending her non-stop plan. After 259 days of sailing which was 6 -7 weeks longer than hoped for and rounding the Five Great Capes, Cape Horn (Chile), Cape of Good Hope (S. Africa), Cape Leeuwin (Australia), S.E. Cape of Tasmania (Australia), S.W. Cape of Stewart Island (New Zealand) and over three months in the Southern Ocean she was successful in her endeavour. Jeanne became the oldest women sailor! Jeanne had her fair share of calms and light winds, and a long passage of head winds in the Pacific Ocean. To add interest to the voyage she rounded Cape Horn with the Vendee Globe racers and she was always on the lookout for large icebergs to avoid in the Southern Ocean. She also received the Ocean Cruising Club's Special Award the Barton Cup in 2014. The Cruising Club of America's 'Blue Water Medal' and the Royal Cruising Club's 'Seamanship Medal'. She was short-listed both for the 'Yachtsman of the Year Award' (U.K.) and also for the 'Yachtworld Hero of the Year Award' (U.S.A.). ﻿This has been noted by the Guinness Book of Records as the oldest women sailor. A lot of lessons learned and magnificent achievement.